Having trouble keeping up with technology? 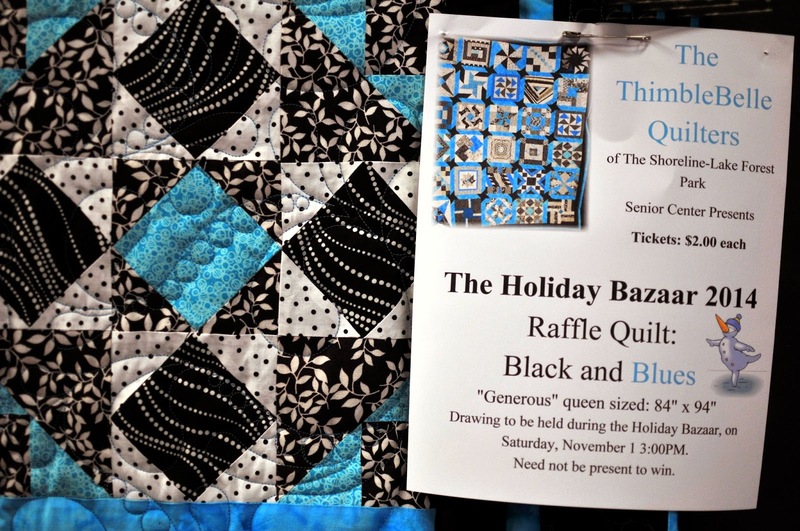 Every year the ThimbleBelle Quilters from the Shoreline Lake Forest Park Senior Center make a quilt and raffle it off as a fund-raiser at the annual Holiday Bazaar. The queen sized quilt is displayed for the first time at the Shoreline Arts Festival, along with other quilts made by members of the group. Tickets are sold for $2 each from June 28 to November 1, 2014, at the Senior Center at 18560 1st Ave NE, Shoreline 98155, 206-365-1536. 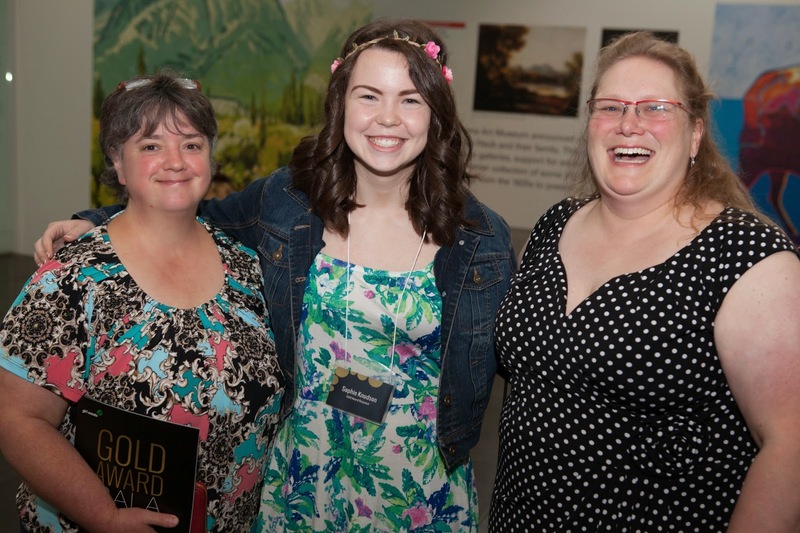 Girl Scouts from Western Washington were honored with awards at the Gold Award Gala on June 22, 2014 at the Tacoma Art Museum. Among them was Sophie Knudson of Lake Forest Park, who successfully started an annual Fun Run to raise money to buy mosquito nets for families in rural Kenya. (See previous story). 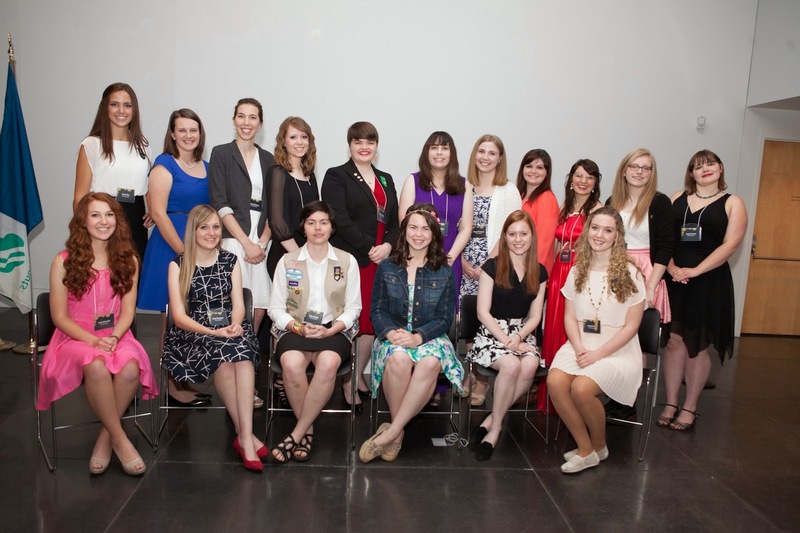 The Gold Award is Girl Scouts highest honor, achieved by only six percent of all girl scouts. Hidden Lake Feasibility Study Public Meeting will be held on Tuesday, July 1, 6:30 to 7:30 p.m. at Shoreview Park, 700 NW Innis Arden Way. Identify alternatives that will reduce the net maintenance cost for managing Hidden Lake. Identify capital projects or strategies that can be incorporated in the City's next six-year Capital Improvement Program (CIP). Maintain or improve water quality in Hidden Lake and Boeing Creek. State education officials have asked the U.S. Department of Education to exempt the state from a requirement that nearly all school districts in Washington send letters to parents stating their schools are failing. 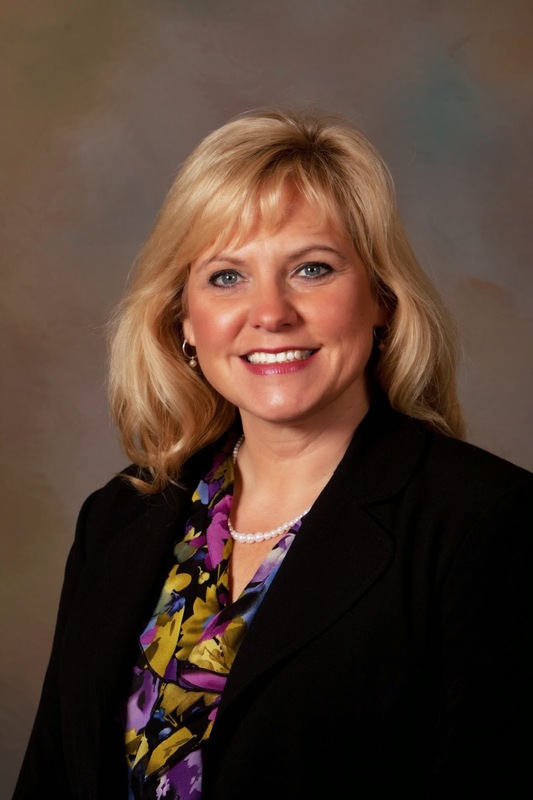 The Office of Superintendent of Public Instruction (OSPI) asked for the exemption last week after WSSDA cited several major concerns with the required letter. No state and only a fraction of schools in the country will meet 100 percent of its Annual Yearly Progress (AYP) requirements, the goal set for Washington State. The original intent of the legislation was to give parents an option to send their children to non-failing schools, but that option will exist in only a handful of districts. The only impact of the letters will be punitive. Good schools will be painted with the same brush as less successful ones. The result will be an erosion of public confidence, making it harder to pass local levy and bond measures needed to continue school improvement. Eight members of Washington’s congressional delegation expressed strong support for Washington’s request in their own letter to the U.S. Department of Education. In its request, OSPI said districts would be hard pressed to send the letter out on time. They would be required to send the letter out at least 14 days before the start of school. Finalization of the year’s AYP measures for districts will last well into August. The process involves both calculation and a review by districts. At the same time, some schools are scheduled to open their doors to students before the end of the month. As part of its request, OSPI said it would promise to notify parents of the progress on AYP using normal communications when school has started. By the end of October, it would report on AYP compliance and the districts that provided the notice of school choice. In a brief comment period, school districts overwhelmingly supported OSPI’s request. The U.S. Department of Education imposed the letter requirement when it cancelled the state’s relatively broad waiver that exempted it from funding penalties for not meeting the stringent requirements of the No Child Left Behind Act passed in 2002. Forty-three states and the District of Columbia have been granted waivers under the law and none are expected to meet the AYP requirements. Washington state is the first to have its waiver revoked. The Department of Education has notified a number of other states that they are in danger of having their waivers pulled. WSSDA is pressing Congress and the administration to amend and reauthorize the federal law, originally passed as the Elementary and Secondary Education Act. More than 70 school boards across Washington have passed resolutions supporting changes to the law. 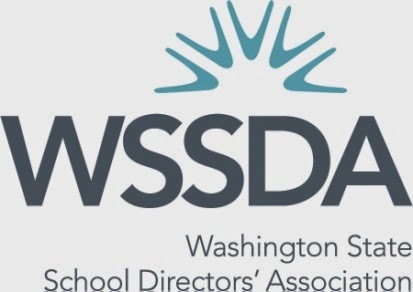 Founded in 1922, the Washington State School Directors’ Association is comprised of all 1,477 school board members from Washington’s 295 school districts. The districts they lead serve more than one million students, have a combined annual budget of $6 billion, and employ nearly 100,000 people. WSSDA’s core mission is focused on ensuring that school board members have the knowledge, tools and services they need to effectively govern their districts and improve student learning. "Elevator Pitch" Luncheon led by Sandy Bjorgen, IMPROV-able Results. Sandy will give an overview on preparing your best 30 second statement that conveys the essence of what you or your business has to offer. Then everyone has an opportunity, if they wish, to practice their pitch to the group. Be sure to bring plenty of business cards to pass around and expect this to be a light hearted event. After the luncheon be sure to make notes on the business cards you collect and follow up with each person you connected with. RSVP required by Tuesday, July 8, for members and visitors, so they can order lunches from Caterer, Special Occasions. To reserve your spot for lunch, send an email to the Chamber and Sharon will confirm your reservation, or register on-line with a credit card. Note: If you need to cancel your reservation you must let the office know before the deadline to avoid being charged. If you do not have a reservation you will be seated on a space available basis. Esta es una serie de clases gratis de siete semanas para padres de familia que desean tener relaciones más cooperatives, respetuosas y aliadas con sus niños. Para más información y para registrarse favor doe comunicarse con: Velia Lara al 206-631-8824. The Attorney General’s Office this week filed suit in King County Superior Court against Mandatory Poster Agency (MPA), doing business as Corporate Records Service, and its top corporate officers, for unfair and deceptive business practices in violation of Washington’s Consumer Protection Act. The company duped more than 2,900 Washington businesses into paying $125 each to prepare unnecessary documents that Washington businesses are not required to file with the Secretary of State. In September 2012, Corporate Records Service sent envelopes marked “Important: Annual Minutes Requirement Statement” to roughly 60,000 Washington businesses. The envelopes contained a document called “2013 Annual Minutes Form; Shareholders, Directors and Officers” and a one-page sheet of instructions. The form came preprinted with the corporation’s name and referenced several Washington laws. There is no requirement for Washington corporations to prepare minutes of their shareholder meetings and the PO Box is registered to “Labor Law Poster Service” of Lansing, Michigan. The Attorney General’s Office requests restitution for all consumers who paid Corporate Records Service— a total of $362,500. The organization could also be required to pay civil penalties of $2,000 per violation. Those mailings also appeared to be government documents and urged businesses to immediately purchase and post certain government safety and labor law posters to comply with the law and avoid government penalties. The posters required by law are actually available free from government agencies. City Hall, Spartan Recreation Center and the Shoreline Pool will be closed on Friday, July 4, in honor of the Independence Day holiday. Wishing you all a happy 4th and remember – fireworks are banned in Shoreline. Next Council meeting is July 14 as Council will be on break from June 30 through July 11! The 2014 Summer PUBLICworks Magazine featured Shoreline's use of goats as part of our vegetation management program.The article was written by Municipal Research Services Center. Last week someone vandalized the carved bench by the pond at the south end of the park in the natural area. This bench had been donated by the Paramount Park Neighborhood Group. Most of the bench was taken except the carved back. Because the bench was a custom design we will not be able to replace it with a similar bench, but we will install a traditional wood bench like we have in other park locations. This year staff will be picking the blueberries at City Hall for the food bank at Hopelink. We are hoping that they will ripen by the week of July 7th! · King County Councilmember Dembowski – Scott MacColl, Intergovernmental Program Manager, and I met with Councilmember Dembowski on Thursday. Our discussion included Metro Service in Shoreline both in the short-term and for the future with light rail and connections for 145th and our partner cities along SR 522. We emphasized how important it is to make the 145th a station connected with transit (not just cars). We asked him to make sure Metro keeps focused on 145th as a transit connector and not change that focus to 130th. Also discussed Point Wells, Seattle Public Utilities water system acquisition, and the Veteran’s Recognition structure proposed at City Hall. · Last week, the Park Board reviewed the design for the art work that will go in at Sunset School Park later this year. 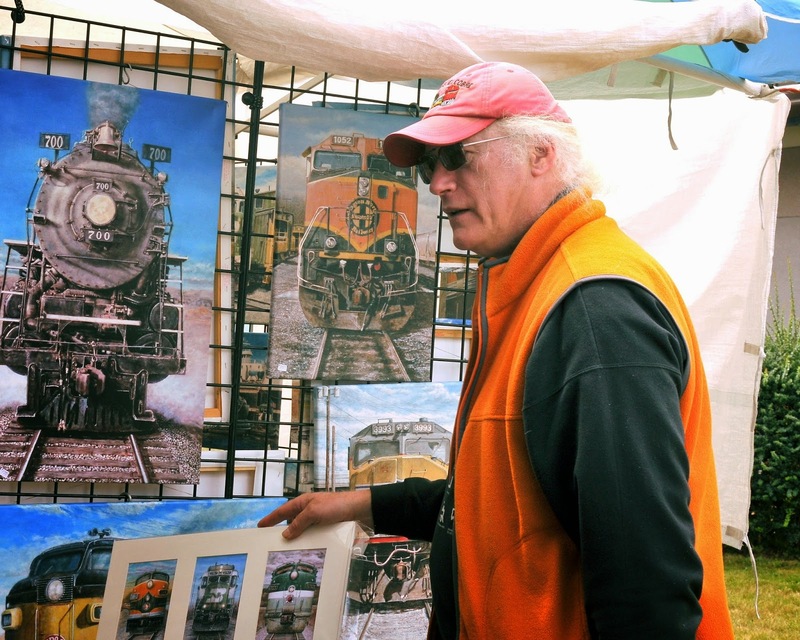 Photographer Wayne Pridemore went to the Shoreline Arts Festival this weekend with camera in hand. He came back with this sampling of the Festival. It's an Arts Festival, so there were many rooms of juried art. 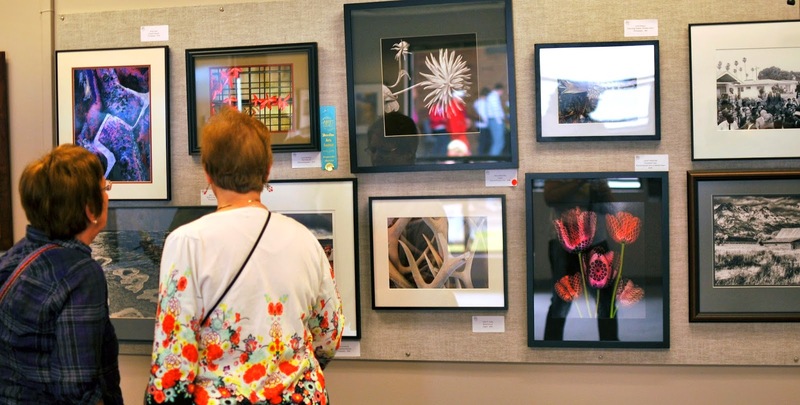 Photography, kids' art, oils, watercolors, and more exotic media graced the walls. Visitors also took the opportunity to admire the permanent collection of student art on the Shoreline Center walls. There was "hands-on" art for children and adults, including the infamous fish paintings, and the wonderful brown paper and weed hats which were worn proudly by boys and girls alike. 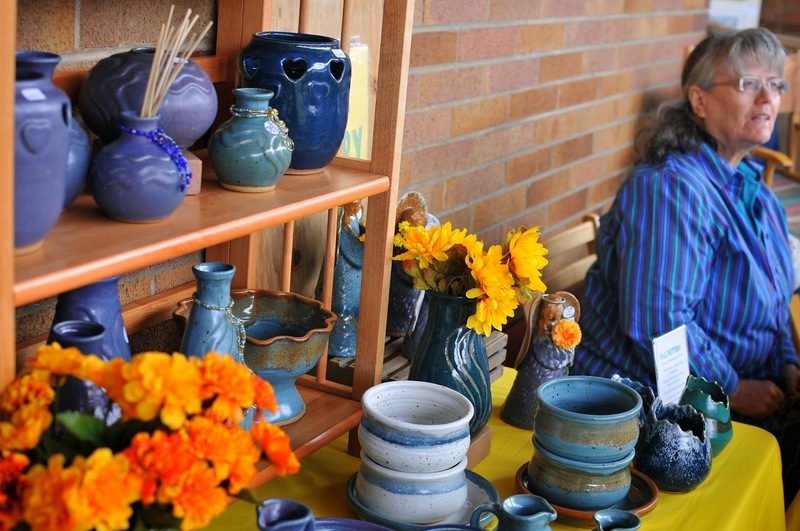 The courtyard was full of artist booths with pottery, photography, crafts, decorative arts. Here's an artist who followed his passion. His only subject matter was trains - but trains in an endless variety. After a one year absence, the sound stage was back at the food court, with a steady line-up of live talent serenading the crowd. The food was very, very good, with a large selection of meals. There were many dogs at the Festival this year - mostly small dogs being carried by their owners. There were a couple of chubby Corgis, a young Doberman, and a couple of cats. Not sure how they felt about the art but they were all quite calm in the crowds. 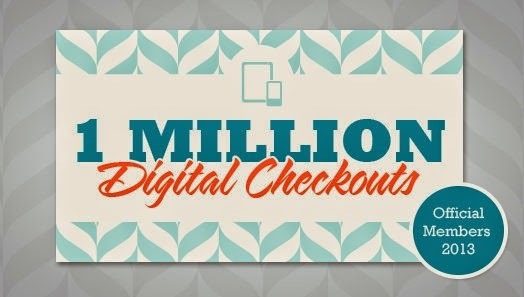 Come to the Shoreline library for a demonstration on how to download King County Library System eBooks to your eReader device or computer . 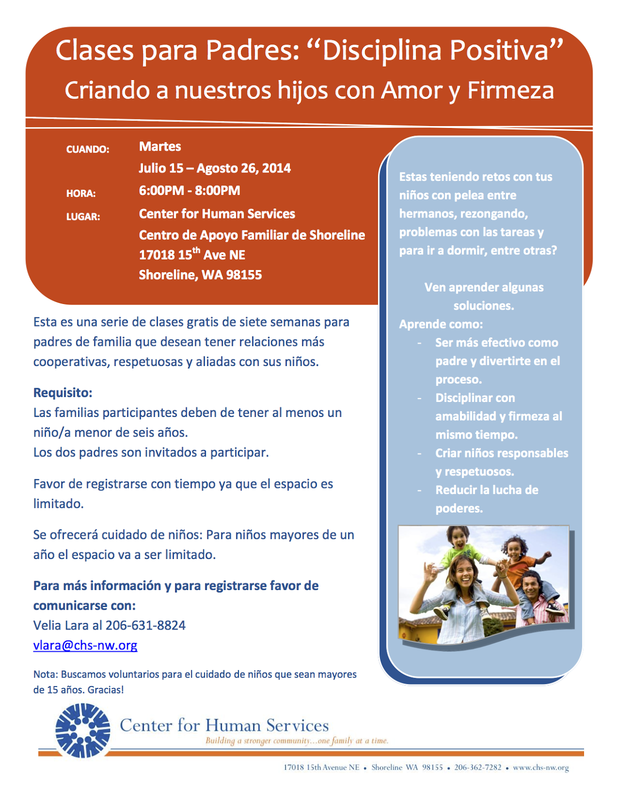 Tuesday, July 1, 2014 fro 1-2pm, Shoreline Library, 345 NE 175th St, Shoreline 98155. Free counseling for small business from the Service Core of Retired Executives (SCORE) on the First and Third Thursday of every month at the Shoreline Library, Small Meeting Room. This month: July 3 and 17. Call 206-362-7550 or visit the Shoreline Library's Information Desk to schedule an appointment between 10am and 3pm. Shoreline Library, 345 NE 175th St, Shoreline 98155. Since the Shoreline Lake Forest Park Senior Center will be closed on Friday, July 4, 2014, the Independence Day Celebration will be on Thursday, July 3rd. The meal will be your choice of BBQ hamburger, hot dog or chicken; corn, roasted potatoes; and berries & cream shortcake. The meal starts at 11:45am but you are advised to arrive early to assure you will have a seat. A $3.00 donation for seniors 60 and older is recommended, and diners under 60 can enjoy this meal for $6.00. You do not have to be a member of the Senior Center. Shoreline Lake Forest Park Senior Center, 18560 1st Ave NE, Suite 1, Shoreline 98155, 206-365-1536. 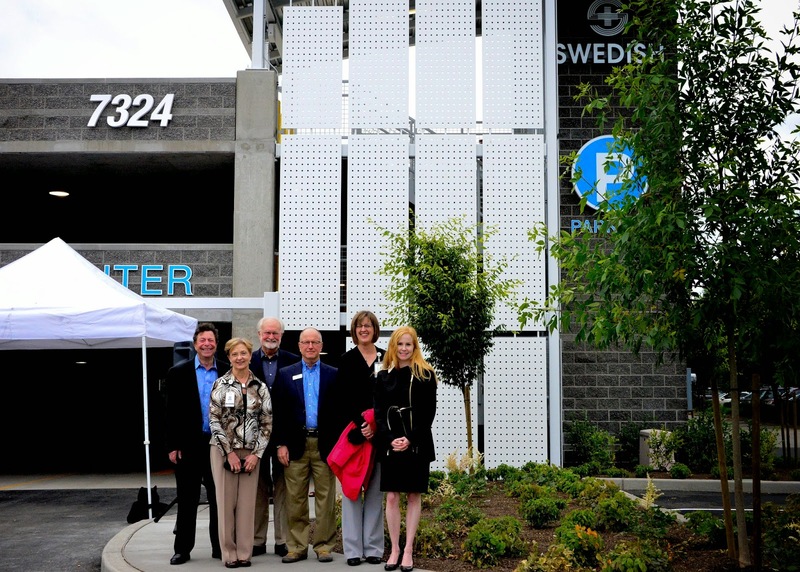 A ribbon-cutting ceremony on June 27, 2014 opened a new Swedish /Edmonds three-story parking garage with more than 350 free parking spaces. Hospital administration and community leaders gathered to officially open the garage, which marked the first part of the largest expansion project for the hospital in more than 40 years. The construction project began six months ago and finished on time and under budget. Now that the garage is complete, the $63.5 million, 77,000-square-foot expansion work will begin. A new emergency department, urgent care center, outpatient diagnostic imaging center, spacious public lobby and more are projected to open in late 2015. Ground-breaking for the next stage of the project is expected in September 2014. Welcome to Summer Recess! It’s not just for kids - City Council is on recess, too. Traditionally we have a two week “recess” at the end of August. This year we decided to change the date so that our recess coincides with the July 4th holiday. There are simply too many fun events in Shoreline at the end of August for anyone to leave town! To me, part of the fun of being on “recess” is saying “I’m on recess!” Because it makes you feel like a kid again to say the word recess, doesn’t it? Even though I will still be working full-time at my other job, and my calendar shows a handful of City-related meetings over the next two weeks, it really is important to take time to relax and re-energize. For me it means getting back into my workout routine, going to one of my son’s softball games, and heading east of the mountains for some time with family and friends. It also means reading a book instead of the weekly Council meeting preparation materials. A friend lent me a book that I’m really enjoying, The Right Words at the Right Time, by Marlo Thomas. It’s a collection of stories from hundreds of people (Muhammad Ali to Dave Matthews), about the words of wisdom that made a difference in their life. I thought a lot about putting out a Facebook request for book recommendations, but I knew I would be overwhelmed with great selections. Our recess is barely two weeks long, so I decided not to put too much pressure on myself, and just spend some time reading something meaningful, but not too long. While I love a good book, my “fun” to-do list is pretty long, and reading a book is only one of the things I’ll be doing over the next two weeks. There won’t be any City Council meetings for the next two Monday evenings, but we will still be checking our email on a daily basis, eating at our local Aurora restaurants and chatting with folks that we randomly run into about the goings on in our beautiful city. In the meantime, I hope that your summer is off to a great start, and that you are enjoying a little recess of your own! I’d also like to request a moment of personal privilege to send my wonderful husband, Stan Hansen, happy birthday wishes, all the way from Shoreline to Dutch Harbor! For other weeks of Crime in Shoreline, see the Features section on the front page. If you see something suspicious, call 911 or 206-296-3311 and let the police check it out. The Missoula Children's Theater staged its annual performance at the Shoreline Arts Festival on Saturday. The organization brings in costumes, sets, and lead actors, then auditions and trains local kids to fill in the rest of the cast. 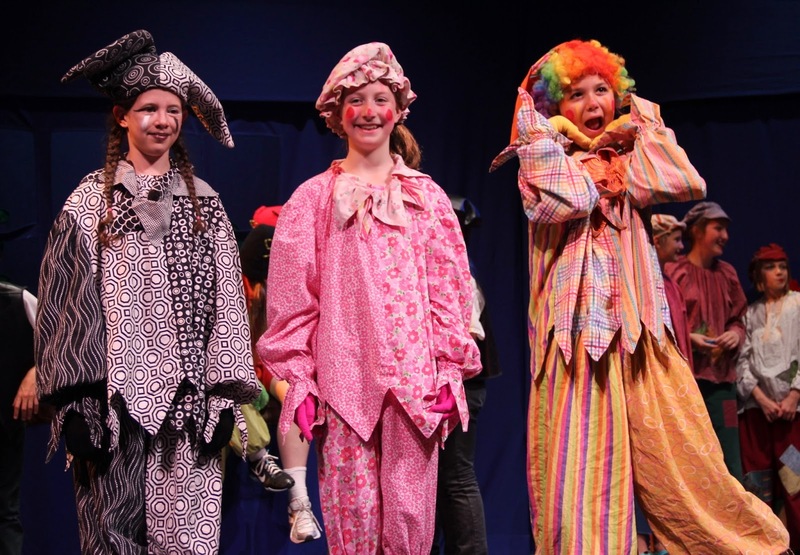 The cast performed Pinnochio this year and will bring a different production next year. The Shoreline Arts Festival continues Sunday until 5pm. 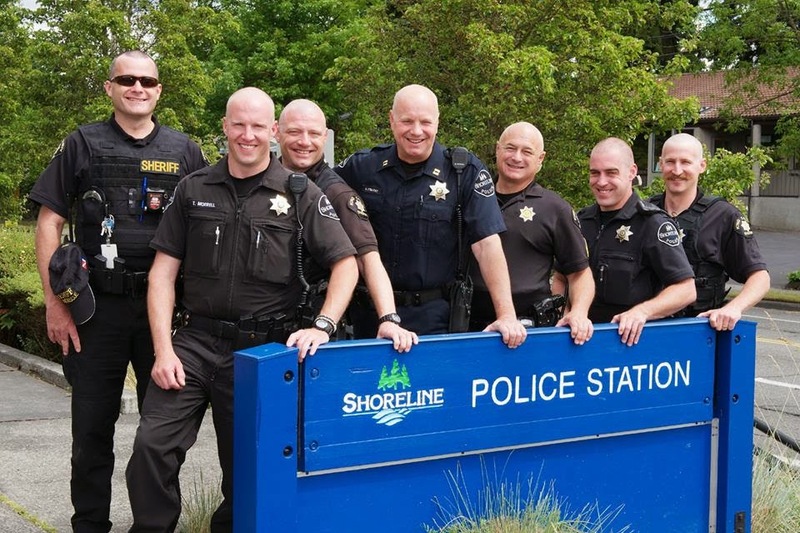 Shoreline Police Officers support a fellow officer in fight against cancer with a head-shaving event. 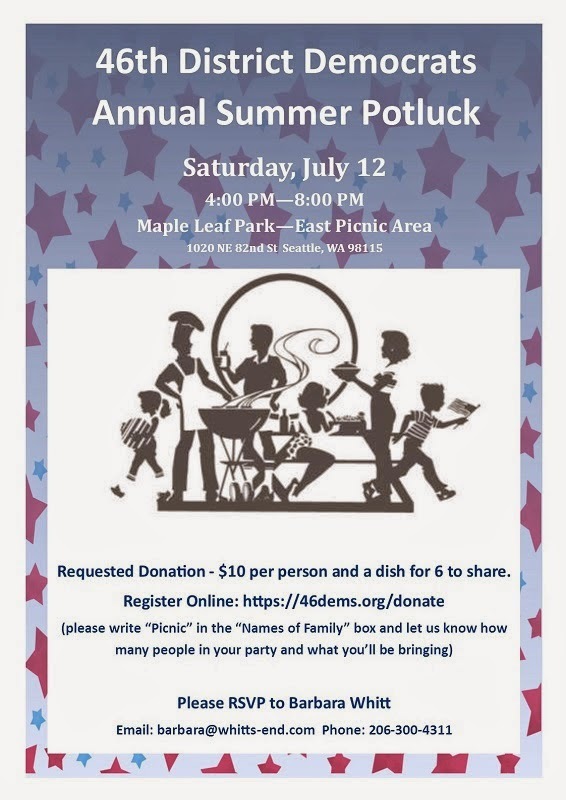 The 46th District Democrats will hold their annual summer potluck on Saturday, July 12, 2014 from 4-8pm at Maple Leaf Park in north Seattle, 1020 NE 82nd, Seattle 98115. If you aren’t familiar with this game, designed for mobile devices, let me get you up to speed. 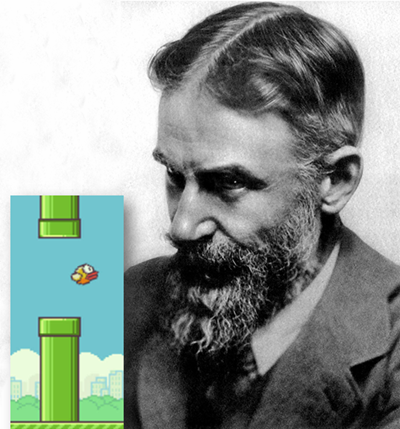 The goal and design of Flappy Bird is very simple; guide a cartoon bird through breaks in columns of green pipes without touching them. You tap your device to keep his wings flapping enough to navigate though the breaks. Of course, that is a fiendishly hard task … and, as it appears, highly addictive. If you’d like an idea of the game, here’s a YouTube video of the game played by a veteran. He made 90 points look easy on this try. Most people manage less than 5 points. Released last year for iOS and Android devices, the game became the number one free game in Apple’s US App store and developed quite a following. 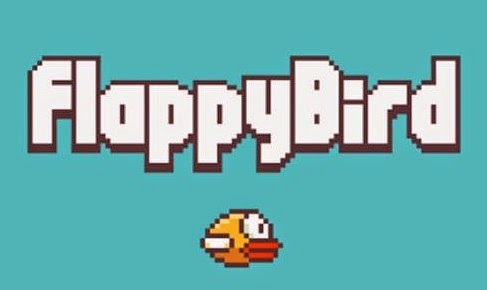 Then, in what Vietnamese creator Dong Nguyen later described as a fit of conscience around the game’s addictive nature, he removed it from both the App Store and Google’s Play store in February. Nguyen received death threats. The prices of phones with the game pre-installed went through the roof on Ebay. Instead of dissipating as Nguyen hoped, the frenzy around the game increased. This is where maximum temptation mixed with maximum opportunity. 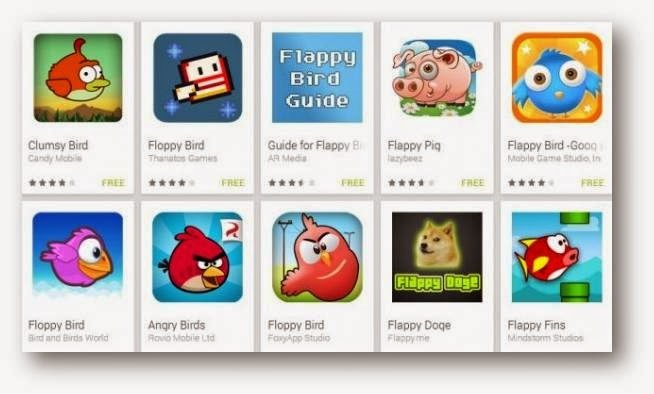 Flappy Bird clones started appearing. Over the next month, Pocket Gamer estimated that 60 clones were appearing each day in the Apple App Store. Apple and Google started rejecting apps that resembled the original game. 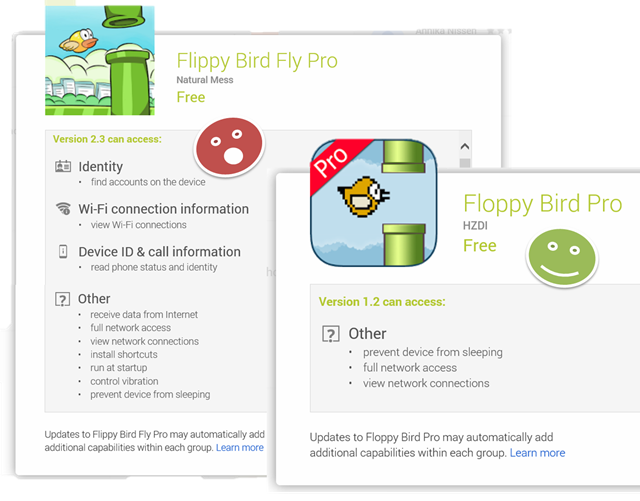 SophosLabs reported in detail one direct copy of fake infected Flappy Bird they found in alternative Android markets within days of the Flappy Bird’s removal from the Google’s Play Store. While not all Clones are malicious, they are rarely as good as the original. ArsTechnica reported on an uncannily duplicated clone of 1Password, a well-regarded password database. 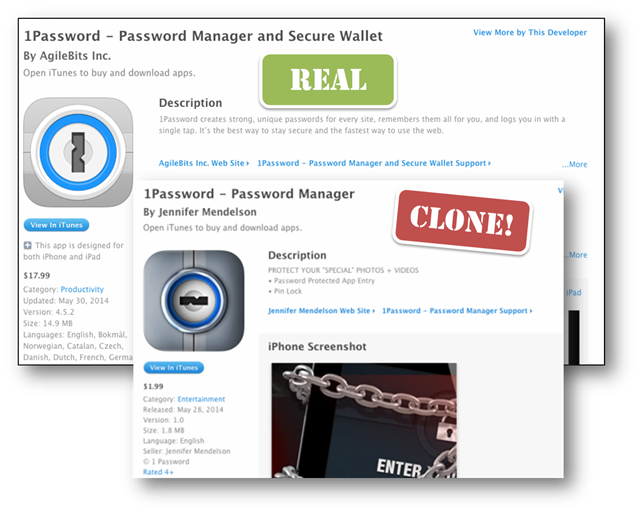 The clone, now removed from the App Store, retailed for $1.99, $16 less than the price of 1 Password developer Agile Bits' original login-storing app and provided less protection. How Do I Avoid Cloned and Possibly Malicious Apps? Make sure that you get the app you are searching for. Often the best place to start is not actually in the mobile store itself. With millions of apps overall and dozens of similar apps, the chance of getting the wrong app is high if you try just searching the store. Start with a general web search for your desired app. Often popular, legitimate apps will have a separate web site or you will find a review site with the app’s information. Either they will have a direct link into the store, or, armed with the app author’s name or company, you will be able to discriminate between the app you want and similarly-named clones. 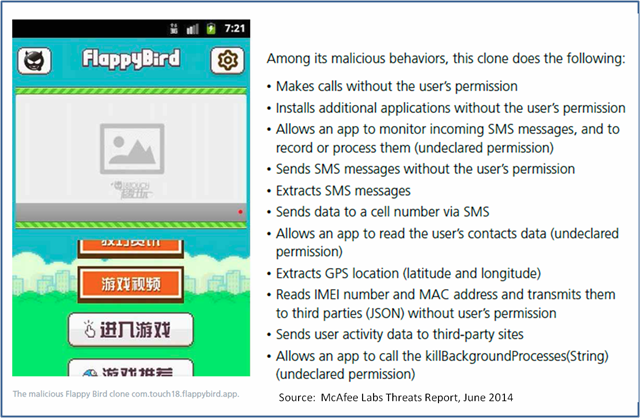 Look carefully at app permissions. This is a screen we usually blow by when getting an app from a mobile store. A free app may need network access to update in-app advertising but it usually doesn’t need to send or review text/SMS message or access your contact information. Look at your permissions in the store before installing the app. Does it make sense, especially when you look at similar apps? 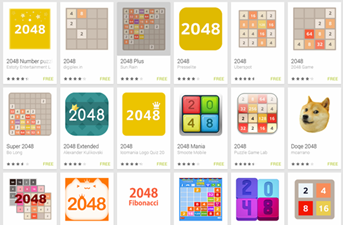 Android users should avoid downloading from third-party stores. While iOS devices must use Apple’s App Store, Android lets you “sideload” apps from other stores. This is important since Amazon, Samsung, and many other smartphones and tablets makers have their own store in addition to the Google’s Play Store … and there are non-affiliated stores I would not use unless you were confident of their app submission policies. I wonder what George Bernard Shaw would have thought of that. 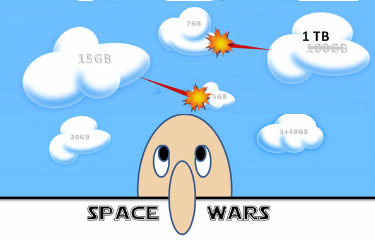 Space Wars: The Wrath of OneDrive? The recent launch of Amazon’s Fire Phone with its cloud storage options two weeks ago has launched a new salvo, followed by a major upgrade by Microsoft of its storage options this past week. The Fire Phone allows you unlimited cloud storage for your entire collection of Amazon purchased books, video, music and photos you have taken on your phone. In addition, you get 5 gigabytes (GB) of “personal storage” and free backup of your phone settings. After my previous exploration of Space Wars, Microsoft returned fire on Monday on the OneDrive Blog by announcing that the 7 GB free that most people had is moving up to 15 GB. In addition, the home version of Office 365 which previously supported 5 people with 20 GB per person of storage is now up to 1 terabytes (TB) per person. This matches it with a similar upgrade in Office 365 for Business a few weeks ago. In addition, prices for additional storage dropped 70%. Who’s next in the Space Wars Saga? It’s anybody’s guess. Do you have a follow up on this topic or technical question on that needs to be answered or explored? Please share it with me at brian@bostonlegacyworks.com. Your question may show up here on Tech Talk. Forecast: Sunday looks like another day of mixed sun and clouds with some sprinkles here and there. Starting Monday we have a rebuilt ridge of high pressure taking over control of our weather for the rest of the week. Tuesday and Wednesday look like they will be quite warm, breaking the 80°F mark for high temperatures. Thursday through next weekend we will cool down again into the low 70's for highs. We may also have some increased cloud cover for the holiday weekend as well, with a possible sprinkle in there somewhere. Humidity: The last few days and on going have felt "muggy" lately. That's because we've had a low pressure off the Vancouver Island coast bringing in the humid warm air from off the Californian coast. The dew points have been averaging above 55°F which is when things start to feel uncomfortable for those accustomed to the Northwest climate. 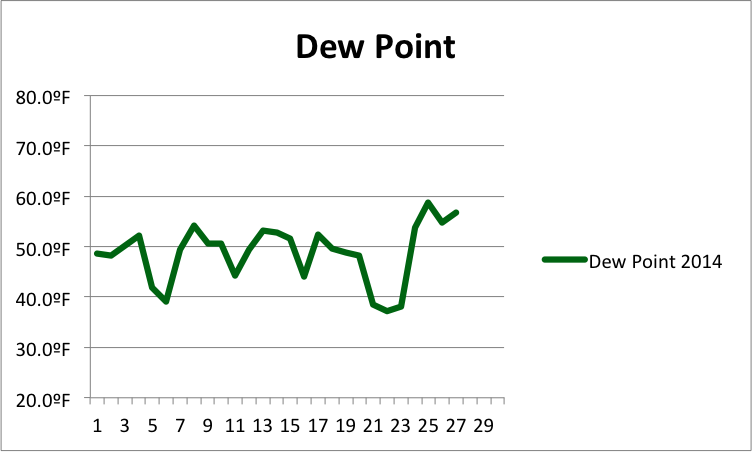 When you look at the dew point graph below you can see how the last few days have been particularly high. Daily Average Dew point in Shoreline for June 2014. 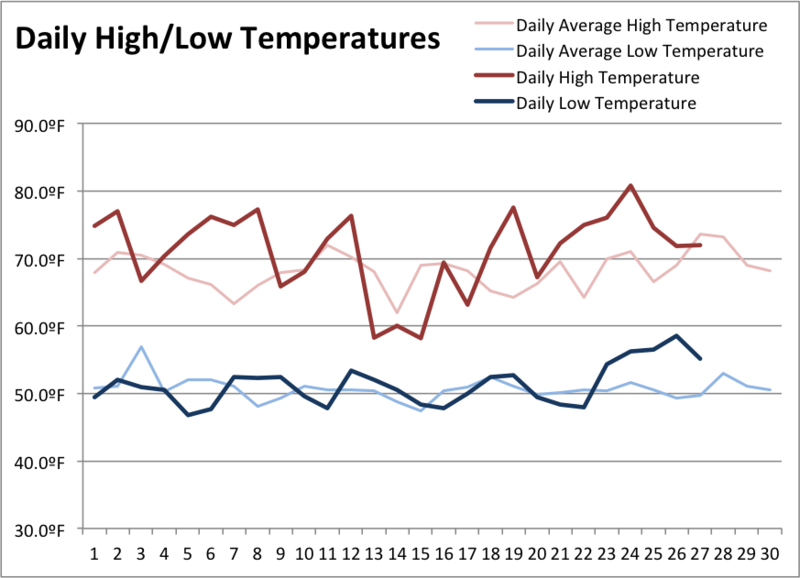 Daily low and high temperature for June 2014. 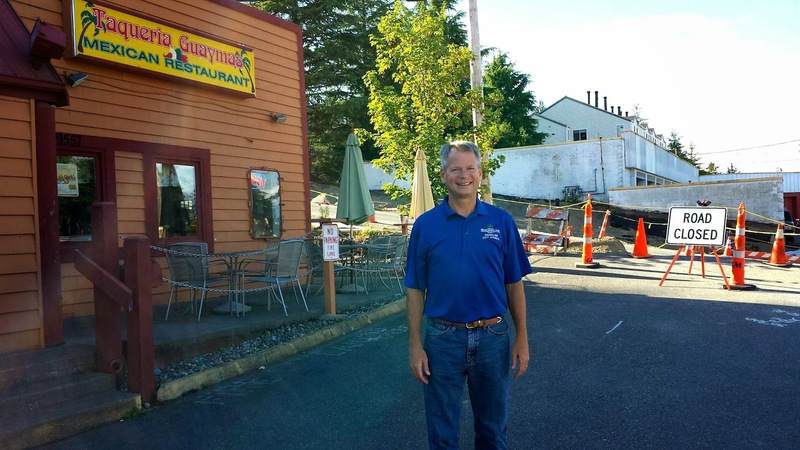 Shoreline City Councilmember Will Hall reports that Taqueria Guaymas is open for business, in spite of the road construction on Aurora. Hall says, "Good for a date night or the whole family. Still plenty of parking, and great fajitas." Taqueria Guaymas is located at 19557 Aurora Ave North, Shoreline 98133, 206-542-0302. The menu is here. This is a sit-down restaurant but you can order to go. Karen Stoufer of Shoreline donates an old flute to David Endicott for the Shoreline Music 4 Life program. The instrument will be sent to Kennelly Keys for refurbishing and then given to a Shoreline student so they can participate in school music programs. Endicott says, "Flutes are in high demand in every school district." The program acquires musical instruments and supplies for eligible public elementary students. “Our goal is to provide every student in the district an opportunity to play a musical instrument, if they want to, regardless of their ability to afford it,” say David Endicott. Donations like Karen Stoufer's are the heart of the program. 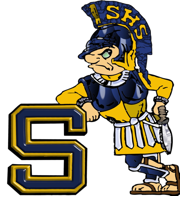 The Shoreline High School “Class of 1972” is expecting over 200 Birthday Boys and Girls at their 60th Birthday Celebration at 6:00pm on Saturday August 16th at the Parlor in Bellevue, Washington. Medical units will be on standby as this group of 60-year olds party like they are in their 20’s. Chaperones may be needed to maintain the sereneness of aging during this big event. Event Chairman, Gregg Fresonke was recently quoted as saying “60 is the new 40”, but his silver hair and receding hairline would say otherwise. The Shoreline High School class of 1972 is trying to find classmates, all of which are turning age 60 this year, as well as retired Shoreline faculty to attend this group birthday reunion. Classmates are urged to provide their contact information on the class website for more information. The birthday event has an all-inclusive cost of $50 for tickets before August 1st. This will include admission, entertainment, beer, wine, food, and tips. Cost increases to $60 after August 1. Co-Chairwomen, Diane Dillan-Smith, Sandi Jones Stewart, Robin King, and Kristin Blecken Adams are rounding up loose classmates and reminding all that they are going to be 68 years old at the next reunion and never going to look younger than right now. On Saturday, July 19, animal lovers and fur-friend fans of all ages are invited to attend one of Shoreline’s biggest ‘Share the Love’ events of the summer when Seattle Area Feline Rescue hosts its Grand Opening celebration in its new Adoption Center location located at 14717 Aurora Ave. N, Shoreline 98133. 12noon to 6pm. 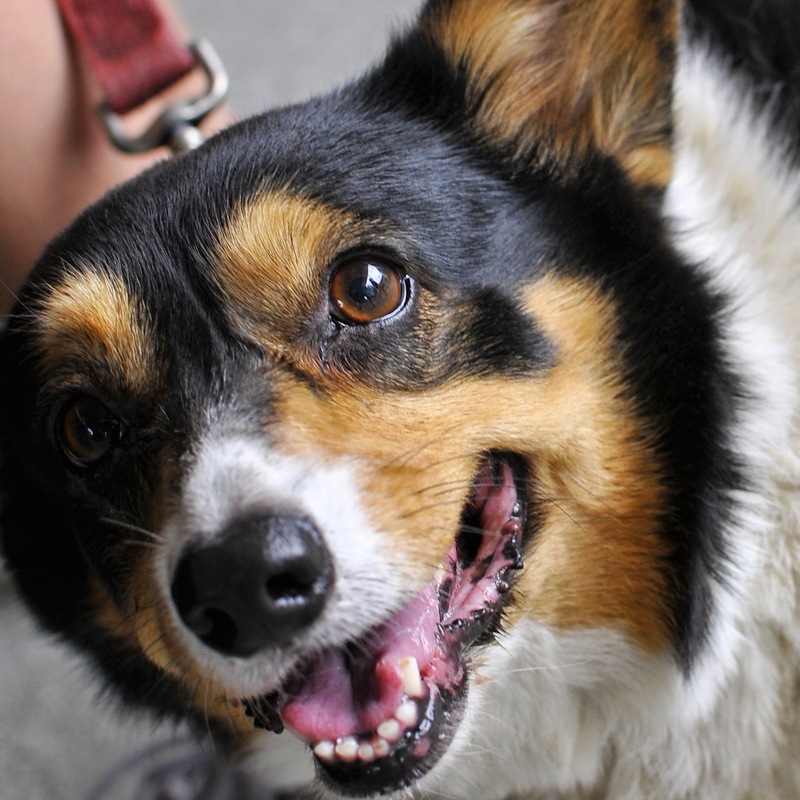 SAFe Rescue invites local animal lovers of all ages to come celebrate! The event will be lots of fun, with snacks, prizes, and opportunities to see some of the rescue’s adorable kitties. The center will house cats and kittens waiting for their forever homes. 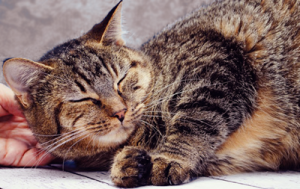 It is designed to welcome the public and provide a fun, stress-free experience for anyone looking to adopt a friendly feline. This center is made possible by the support of local animal lovers, who have contributed funds and many volunteer hours to its construction. Seattle Area Feline Rescue (formerly Animal Talk Rescue) is a 501c3 non-profit, no-kill rescue founded in 2000 with a mission to end the plight and suffering of homeless, neglected and abused companion animals, and to educate the public about the benefits of spaying and neutering. The rescue is currently looking for volunteers, foster families, and adopters for its felines. Those interested can find out more by attending the Grand Opening or by contacting the group by email. The Shoreline Planning Commission will hold a special meeting / public hearing on Thursday, July 10, 2014 at 7pm in Shoreline City Hall's Council Chamber, 17500 Midvale Ave N.
The full agenda is online as well as the full packet of documents. Those unable to attend the meeting may submit comments by email. Tomorrow morning, the Richmond Beach Running Club will run the Edmonds/Woodway lower route listed HERE after the warm-up run around the park. 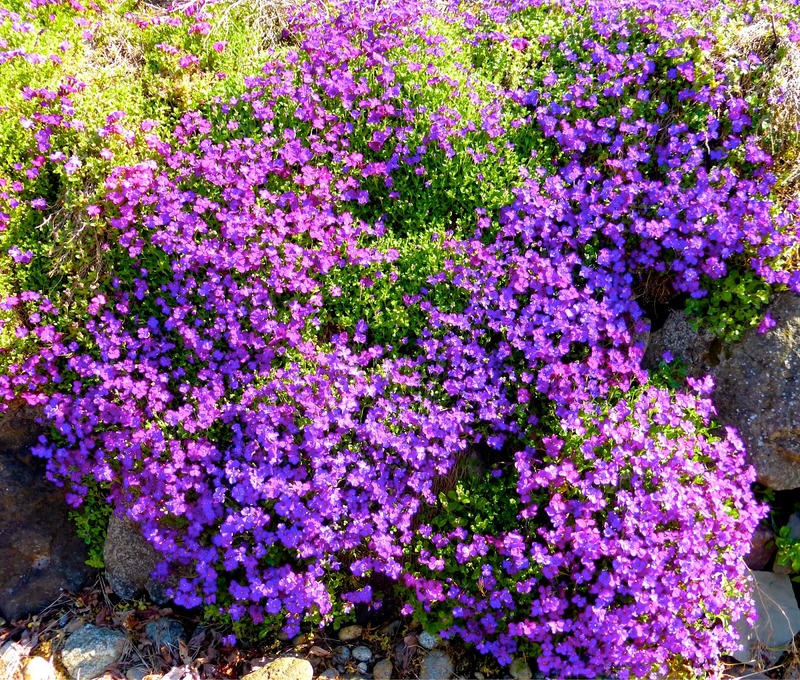 Meet at the Richmond Beach Coffee Company (1442 NW Richmond Beach Rd Shoreline, WA 98177), Saturday, 8:00am in the parking lot, rain or shine. Participants are encouraged to find street parking so as to not overwhelm the coffee house parking. Runners are of all types and backgrounds, from beginning runners to experienced racers. They usually do a warm-up mile around the beautiful views of Richmond Beach Saltwater park and head out on an hour run, where paces from 7-12 minute miles are common. Contact HERE for more information if you are interested in joining this community of runners. At this point, the group is completely free, though they occasionally sell team t-shirts or ask for small donations to raise funds for nominal expenses that arise. Bring your children for great drop-in childcare. 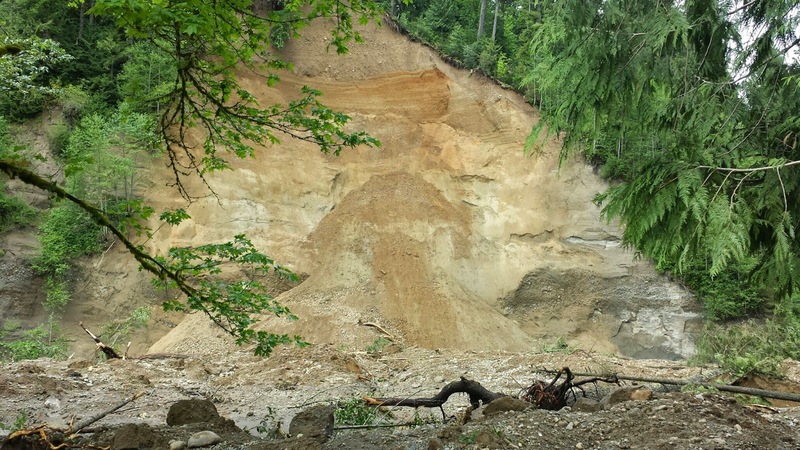 To prevent loss of life and protect property during 10 known natural hazards in the region, King County updates its Regional Hazard Mitigation Plan every five years. King County Emergency Management worked with 54 regional planning partners -- including cities, school districts, hospitals, fire districts, and others -- to propose updates to the plan. The public is invited to review and comment on the latest proposed update to the plan, which includes strategies to minimize the risks associated with natural hazards. King County will host three public meetings and made the proposed update available online. The other meetings are in Snoqualmie and Issaquah. The comment period ends July 11, 2014. Comments may be submitted at the meeting or submitted via email. Full documents and a Frequently Asked Questions article are online at the King County webpage. According to preliminary state-level data released this week by State Superintendent Randy Dorn, nearly 93 percent of Washington’s 12th-grade students in the Class of 2014 passed both the state reading and writing high school proficiency exams (HSPE), or state-approved alternatives, prior to reaching their respective graduation ceremonies. In addition to the HSPE, students must also pass a math end-of-course (EOC) exam in algebra I or geometry. EOCs are administered during the last three weeks of school. Preliminary results will be returned in late August, along with preliminary results from the Measurements of Student Progress for grades 3 through 8 and district- and school-level numbers for the HSPE. Final results for all exams will be available in the fall. 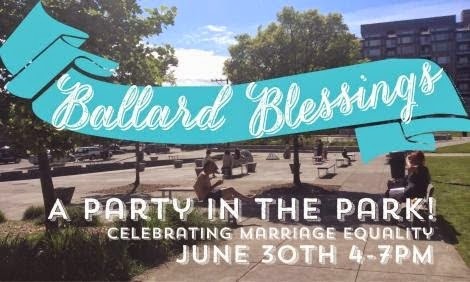 Ballard Blessings in the Park at Ballard Commons Park (5501 22nd Ave NW) is set to celebrate the final phase in Washington State legalizing marriage equality June 30. On this day Washington State will convert domestic partnerships into marriages. From 4pm to 7pm blessings will be offered to all, including couples uniting in marriage and celebrating the State's decision around marriage equality. 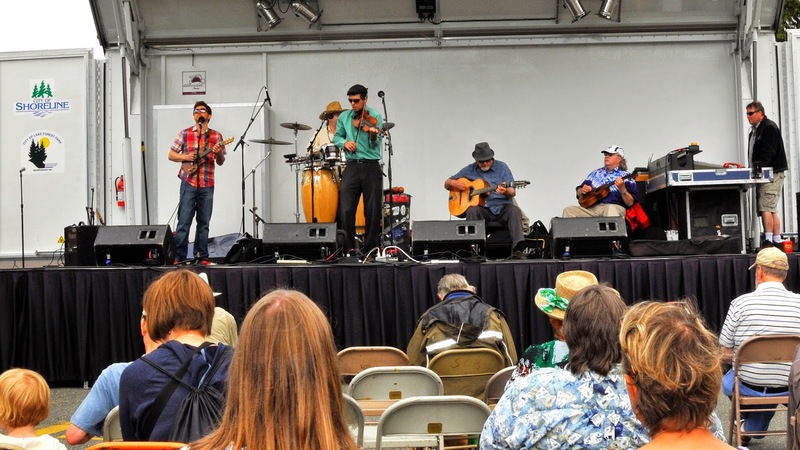 The event is free to the public and attendees can expect food trucks and free ice cream (courtesy of Umpqua Bank), as well as live entertainment from Alleyoop and The Weavils. Kids face-painting will be offered and Bubbleman is rumored to make an appearance. This event was a collaboration with local churches and religious organizations as well as businesses. A power outage affecting customers in central Shoreline is expected to be resolved during the evening hours of Friday, June 27. 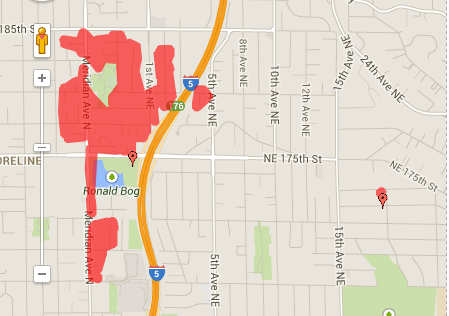 As of 9pm, there were two outage areas affecting 396 customers. The main outage was apparently caused by a serious traffic accident on Meridian Ave N between 198th and 200th, which took down a power pole. 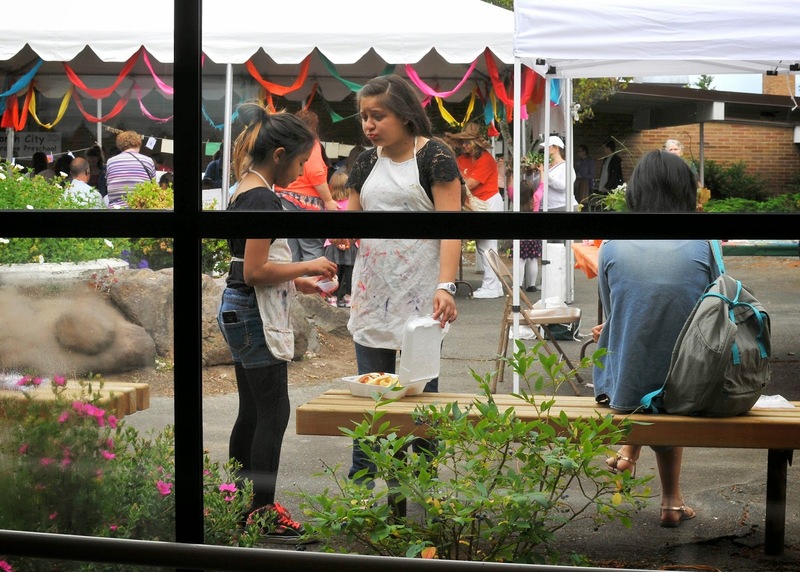 Breakfast will be served at the Shoreline-Lake Forest Park Senior Center dining room from 8:30am to noon during this weekend’s Arts Festival, June 28 and 29. Before you head out for the many activities throughout the conference center you can enjoy some pretty nifty choices from the breakfast menu: pancakes (apple cinnamon or blueberry) French Toast, sausages, scrambled eggs, The Shoreline Scramble and more! Also, during the festival, the Senior Center’s thrift shop, The Bargain Corner, will be open during festival hours. (10-6 Saturday, 10-5 Sunday). There is a shop special going on: buy two clothing items at regular price; get one of equal or less value FREE! On Saturday, after you’ve had your amazing breakfast, go to the Shoreline Room to hear our Senior Singers at 10:45am. This group of beautiful singers is the festival entertainment’s opening act. They have worked hard to present a fun, musical program. 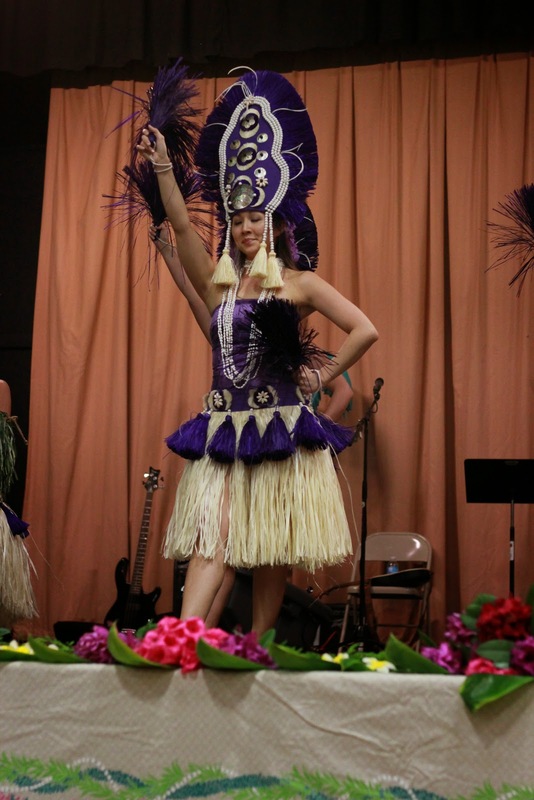 At 1:00pm, The Hokulani Hula Dancers and the Kupunas will be performing. 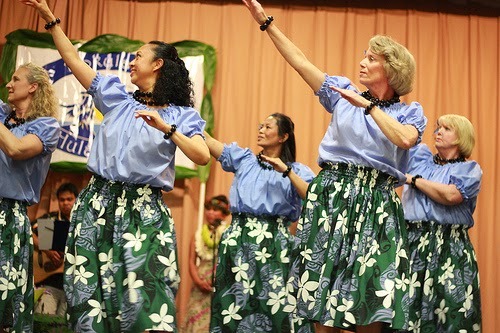 Dancers range in age from 3 to 94, and are performing traditional hulas representing the islands of Hawaii as well Tahitian and Maori dances. 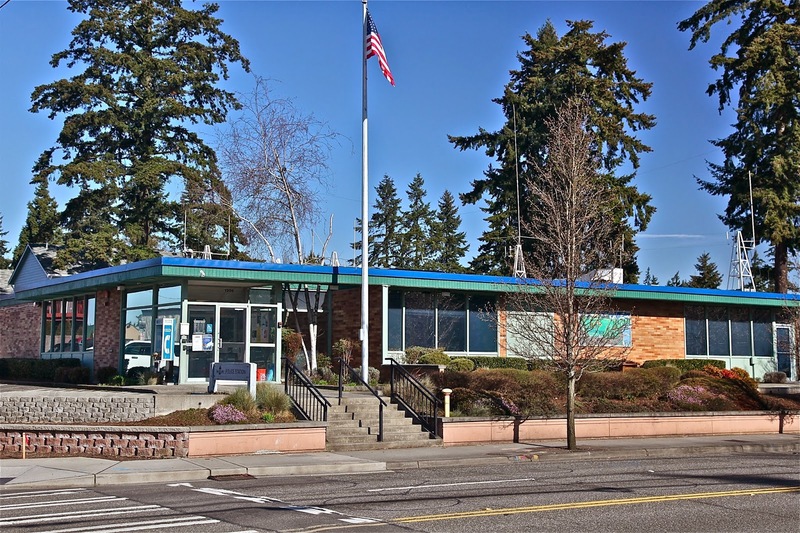 The Senior Center is located in the southern-most building of the Shoreline Center, 18560 1st Ave NE #1; 206-365-1536. Learn more about the center and what it can offer the seniors of our community on-line. Count your blessings day by day! As you live your life each day! Without a clue as to how lucky they are! There’s a lot of things that go wrong in your life! On the other hand, there’s a lot that goes right.